To continue the correctional series I’m going to be moving into the topic of specific tightness hockey players run into due to the movement mechanics of the game. Tightness plays a large role in athletic development and athletic performance. Think about the people in your life; the ones who are super inflexible are also usually the worst athletes. I can’t think any anybody I have ever met who was reaching their athletic potential while still being very tight. It doesn’t happen. When you’re tight, you can’t move properly. When you can’t move properly, that is the first domino that knocks over many dominos from a performance perspective. It doesn’t just limit your range of motion. Being tight limits your agility, starting speed, top speed, puck handling ability, high velocity direction change, stretch/reflex potential and power potential – All major factors that need to be working in sync in order to have you perform at your best on the ice. One of the biggest reasons why I address tightness through social media outlets is the fact that it goes unrecognized in a lot of the hockey world as a performance potentiator. Normally people pass it off as “I’m just inflexible”, or the coach will say something like “You have to work on your stretches” without actually giving a well thought out approach to addressing the issues that the athlete presents. Targeting and improving tightness is a way to improve performance without even changing anything else. You could be training the same, eating the same, whatever your routine is. 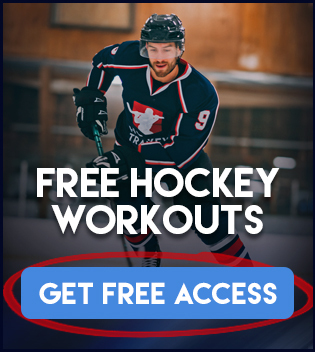 If you corrected your tightness, even though you’re essentially still the same guy, you will perform better on the ice directly because you will be able to move better. Muscle tightness in hockey is honestly pretty universal. 80% of the guys present a lot of the same issues in my experience. That is tight hips / hip flexors, Achilles tendon, calves, vastus lateralis, hamstrings (biceps femoris), low back and shoulders. There are certain exercises and ways to address all of these issues but keep in mind I am talking to a large audience so the exercises I suggest, although they will help, may not be 100% appropriate for your body type based on limb length, height and issues presented. Let’s first have a look at the hips. I discussed these briefly in the structural balance blog and certain complications they bring. To recap, if you look at a hockey player he is bent over at the waist for pretty much the entire game. During a face-off, when taking a shot, when skating and even sitting on the bench. This shortens and tightens the hip flexors which can lead to a whole host of postural issues including pain in the hips during movement, tightness in the hips, rounded shoulders, shoulder impingements, low back lordosis and a forward lean in the neck. These are issues that have to be addressed as soon as the offseason training begins because during the season it is tough to get the necessary work done. With travelling, scheduling and injuries the gym more often than not takes the back seat. In addition to the above, chronic bending over at the waist causes the pelvis to rotate forward, creating that low back lordosis (this will show itself a lot if you perform a barbell overhead squat) but can also affect the core muscles ability to fire properly. Core strength is critical in transferring the power from your lower body to the upper body. All power originates from the ground up and if your core is not up to par your ability to produce power takes a negative hit. Starting to see how everything has a ripple effect to different faucets of the game when tightness isn’t properly addressed? Probably the best exercise out there to address hip tightness for hockey players is the Bulgarian split squat. You won’t like doing it, but you have to do it. If the Bulgarian split squat is too hard for you, normal split squats, front foot elevated split squats and various forms of lunges all help the situation as well. If you find Bulgarian split squats are great and you want another even more difficult challenge to implement once in a while, try front foot elevated Bulgarian split squats. This gives your hips an even greater range of motion leading to greater flexibility and movement. Remember the hips connect both your upper body and lower body musculature, if you have tight hips you throw off all movement mechanics. Breaking this tightness will also really help the low back tightness in the process. The Achilles tendon and calves tightness together pops up in tons of hockey players and I believe it is mainly due skating mechanics in comparison to running mechanics. When running you have a much greater ability to fully extend the foot (pointing the toe downwards) in a straight on movement. Whereas in hockey the foot is sideways and there is much less overall extension but still a ton of tension which can create tightness overtime. Whatever the case may be, hockey players have it so we have to address it to improve overall performance. This is an issue that is corrected faster than the hip issue and is also relatively simple. First and foremost allowing your knee to go past your toe during split squats and lower body unilateral work helps stretch the calve and Achilles tendon. Before you ask me, yes it is 100% fine for you to allow your knee to pass your toe, despite what your personal trainer or gym teacher told you. That is one of the oldest dumbest myths currently talked about, so let’s save that conversation for another day. In addition to the above method to help address Achilles tendon and calve tightness, allowing yourself a 2-4 second pause in the stretched position in calf raises drastically speeds up the process. I find athletes improve flexibility quite drastically doing this in as little as 4 weeks. The biceps femoris muscle of the hamstring in combination with the vastus lateralis muscle in the quadriceps both get tightened for the same reasons, they are prime movers in the force generated during skating. One of the biceps femoris main jobs is to point the foot outwards, which is the position hockey players feet are in whenever they are skating. The vastus lateralis is that big muscle on the outside of your quad, it’s his job to apply force down on the ice to propel you forward. Both of these muscles get overused during hockey which leads to them both becoming tight as a rock. Most hockey players when it comes time for the offseason have biceps femoris and vastus lateralis muscles that resemble steel rods. Way to tight in order to function properly. An important thing to note is that the vastus lateralis connects to the knee and when it tightens it is also more susceptible to bring the knee out of place, not good! This can cause not just acute injury but long term injury. Certain strength training exercises can help with the biceps femoris and vastus lateralis but this is really an issue that requires manual work, much more so than either of the above issues. Although if you can afford to get manual work done on all of them that is the best option for any of these. When I say manual work, I mean foam rolling, massage, myofascial release, active release, etc. Whatever fits your schedule and wallet. Last but not least the infamous rounded shoulder posture. When you’re standing in a relaxed position, your shoulders shouldn’t be pulled forward. They should be at your side. Also, in a relaxed position they should be symmetrical in height. One should not be higher or lower than the other. This type of tightness usually results in a forward head lean as well. Addressing shoulder tightness with hockey players is extremely important for puck handling ability, shot power and shot accuracy. The internal and external rotator muscles work together to create a lot of this motion and hockey players normally have a bigger issue with their external rotators and specifically their scapula retractors. To strengthen these muscles up to par and also increasing their flexibility along the way (provided you use proper technique) I find Powell raises, DB power cleans, BB Cuban press, L-lateral raises with external rotation, Trap-3 raise and face pulls to be the best. Getting stronger in these exercises are going to improve your game, posture and rotator flexibility. • Tightness in hockey players is always in the hips, low back, vastus lateralis, biceps femoris, calves/Achilles tendon and shoulders. But hips more often than anything else. • Direct manual therapy is the best option if you can get it done, but should never be done without also addressing it through strength training. You need both. • Strength training alone can solve most if not all of the problems when done properly, but is still not as effective as when it’s combined with manual therapy. • Static and Dynamic flexibility program design in combination with the above makes for the ultimate approach and will be a topic of a blog coming soon. • To play to your potential and be the best hockey player you’re going to be, you have to address tightness in the offseason. 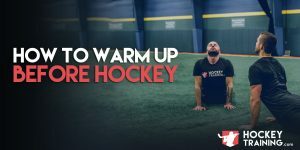 Our hockey training programs will help you correct your muscle tightness problems that all hockey players get, and this will instantly help increase your performance on the ice. Go check them out now!